The Cuisinart MCP55-30N is a MultiClad Pro Stainless 5-1/2- Quart Casserole. It is designed with two large stainless steel loop grips and features heat surround technology that allows even heat distribution along the base and side walls of cookware by elimanating hot spots. The Product comes with cool grip handle and Professional Triple Ply Construction. The 55Qt Casserole W/Cover Multiclad Pro Tri-Ply Stainless has many exciting features for users of all types. See the 55Qt Casserole W/Cover Multiclad Pro Tri-Ply Stainless gallery images above for more product views. 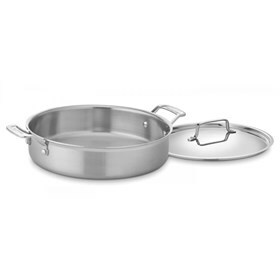 The 55Qt Casserole W/Cover Multiclad Pro Tri-Ply Stainless is sold as a Brand New Unopened Item.